Katie Holmes Shares Rare New Photo of Daughter Suri! Katie Holmes checks both ways before crossing the street on Sunday afternoon (March 24) in New York City. The 40-year-old actress stayed comfy in a blue Park City, Utah hoodie and gray sweatpants as she stepped out to run a few errands. Katie was recently in Greece where she and 12-year-old daughter Suri visited families at the Moria Refugee Camp. While they were there, Katie took to Instagram to share a rare photo of Suri playing with another one of the kids there! Suri Cruise Runs Lemonade Stand at NYC Pride Parade 2018! Katie Holmes Posts New Photo of Suri Cruise on 12th Birthday! Katie Holmes & Suri Sit Courtside at the Knicks Game! 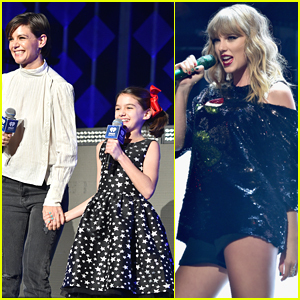 Katie Holmes & Daughter Suri Introduce Taylor Swift at Z100 Jingle Ball in NYC! Katie Holmes Takes Daughter Suri to See 'Dear Evan Hansen' on Broadway! Katie Holmes' Daughter Suri Cruise Is Her Mini-Me! Katie Holmes Shares Cute New Photo of Suri with Her Cousins! Katie Holmes & Daughter Suri Catch the Lakers Game! Suri Cruise Beats Mom Katie Holmes at Thanksgiving Games!